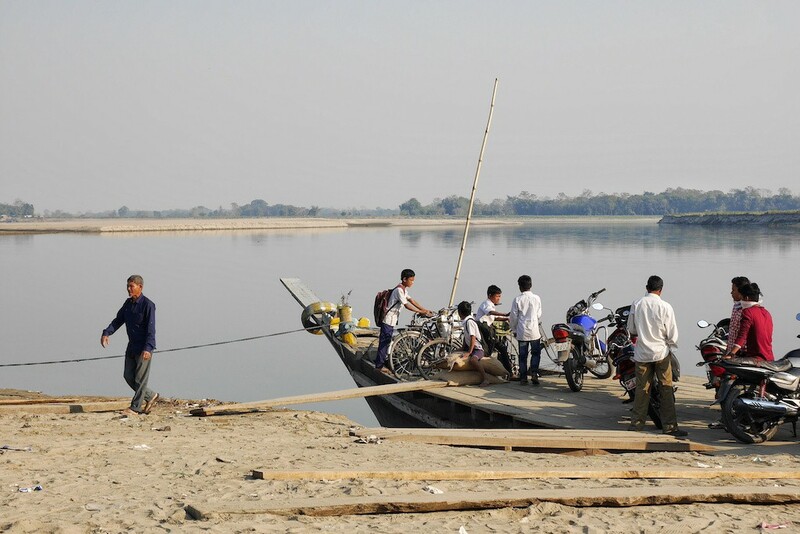 I arrived at Majuli with empty expectations. The two weeks that I was on the road crisscrossing the states of Arunachal and Assam, it left me with the not-so-good impression of the people of Assam. 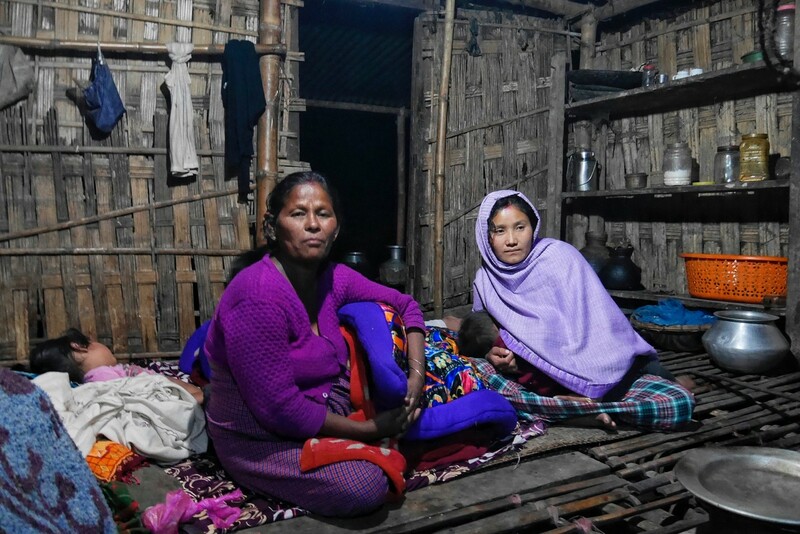 Like, in general, the faces are weary and devoid of any smile unlike the people in Arunachal who are incredibly warm. But I was looking forward to spending time with the Majuli’s Mishing Tribe which is one of the largest ethnic tribes of Assam. 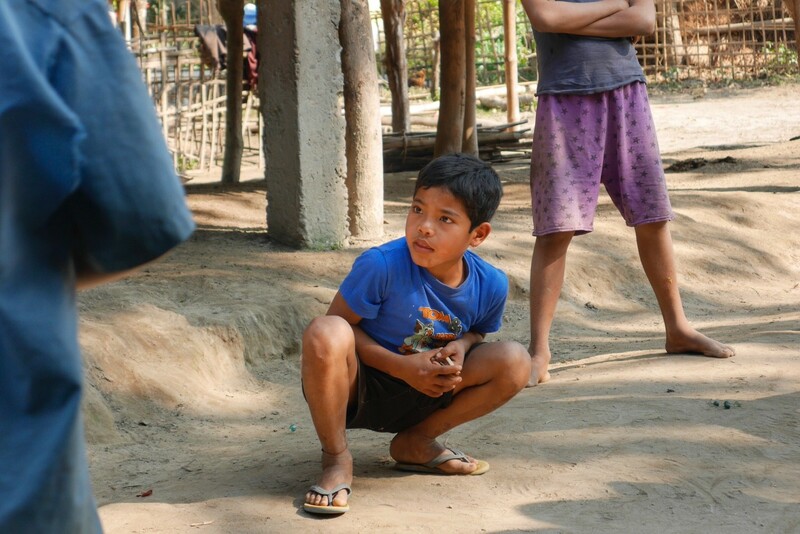 The tribe is a descendant of early Tibetan-Burmese speakers in this region. Today their population is only a million and a half settled in Assam and Arunachal Pradesh. Without much anticipation, I made way to the last stop of my trip, Majuli Island – the largest river island in the world. A quick one-hour boat ride brought me to Majuli from Jorhat. By the time I reached my host’s house near Garmur Satra, it was black as pitch. I was on a biking trip with a friend in this region. The sight of dusted duffel bags and sooty eyes made people curious of our whereabouts. They wanted to make conversation, but despaired of not finding a common language; they soon left us on our own. I looked around and found all the houses look alike – bamboo huts on stilts. The pigs and fowls were making frequent appearances on the street. We were sitting in a house of an old woman. She wore her saree in the traditional Mishing way. For whatever little time I had spent at this woman’s house, she made us a generous meal and the fact that we didn’t speak each other’s language didn’t stop her from talking to me. The tribe speaks Mishing which is similar to Assamese but still different. She was making all attempts to know about me. It was a moment when words defy and feelings transpire. As I spent more time knowing them, I realised that this tribe live in small settlements mostly with their family and relatives, and it is a norm to eat or sleep in anybody’s house. My host – a 28-year-old man who was the only interpreter with broken Hindi, took me to his house where my sleeping arrangements were made, the reason he gave was “We have ladies at home you will be more comfortable.” That moment I didn’t know that the next two days were going to be the turning point of my trip. It was a prosperous house with many women and kids. The most congenial was the host’s mother who would frequently be chortled. The other two women were the host’s sister and wife who were equally pleasing but shy. 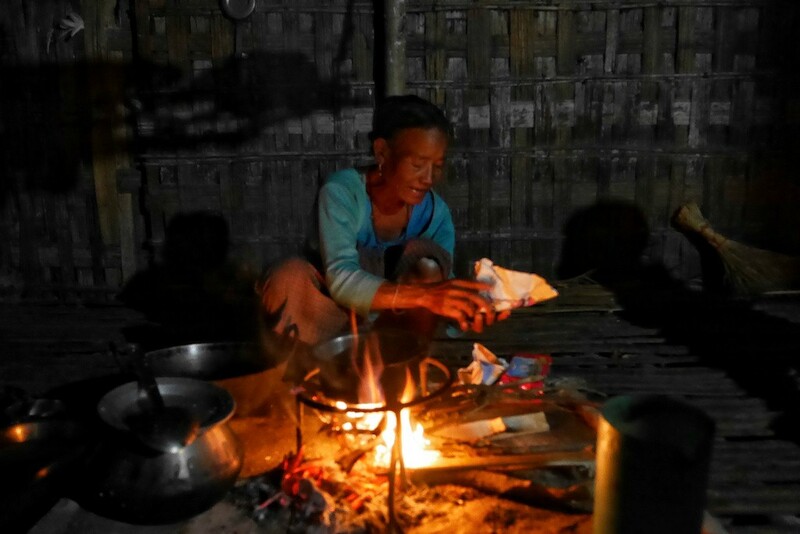 It was 11’o clock in the night, the free flow of Apong (the local rice wine) was nowhere to an end. Having said that I didn’t mind drinking it, but was worried about where to release it during the night in the jungle. In just a couple of hours, the passing thought that came to my mind became a reality. I needed to pee! The house that was bustling with noise was now silent as the grave. At first, I thought I’ll wait till the morning, but then I couldn’t hold and shook the sister sleeping in the adjacent room. I couldn’t believe my ears to what she said in her feeble voice, so I asked her again, and she repeated: “you can do it behind the room separator.” I went behind and saw a wide gap between the two bamboo shafts. I couldn’t care less. It was the most convenient way of peeing ever! Mornings were unique. That was the time when I could live the way they do. Starting from using the communal toilet and freshening up at the hand pump to the gulping down two-three cups of Lal Chah with orange cream biscuits, life was good with no additional necessities. I heard the jarring Mishing songs coming out of the loudspeaker somewhere from the village. They told me it was the first death anniversary celebration of an old lady, and at least 1,000 people from nearby villages are coming today for the feast. I got an invite too! I went there and saw that the major part of the jamboree involves the washing, scrubbing, butchering of the pig and relishing the pork dishes. At least ten large pigs were slaughtered in front of me if not less. 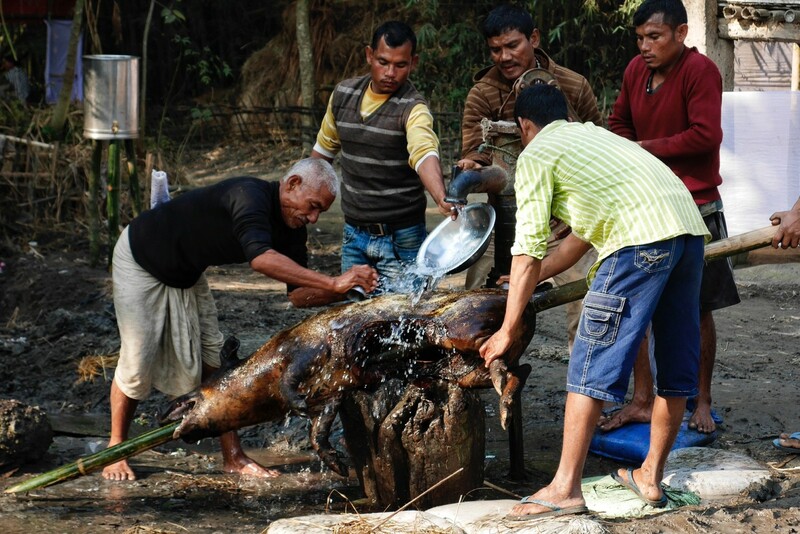 I appreciate their culture, but after a while, it started to gross me out seeing the gallons of blood and tonnes of flesh lying for the gluttony to be satisfied. I decided to take a break and walked around the village. I noticed that each house had a weaving set up; it is an everyday activity that women do in their spare time. 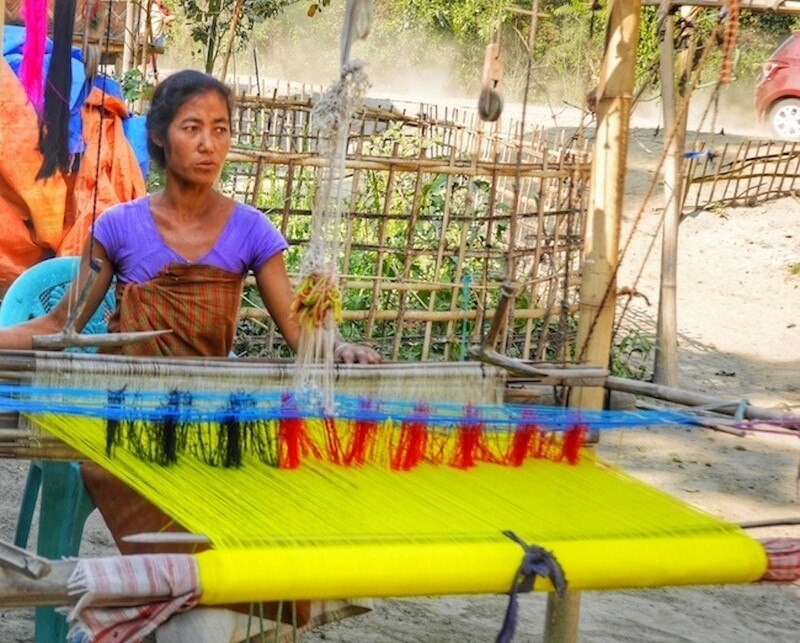 The intertwining of the colourful threads is how they get their beautiful traditional attire – Galuk. I was walking away from the hubbub and entered another settlement which gave me a gist of what it is to live here – men were lazing, young kids playing with the marbles and the chanting from the nearby Satras. The mention of Satras made me question their religious beliefs. They traditionally have faith in Donyi-Polo (praying to the sun and the moon) but follow Hinduism at the same time. However, Christian missionaries also exist in the interior parts of Majuli. It gets dark soon in Majuli. I came back to spend my last night with the lovely host family who got back from the celebration and were already sitting around the hearth, as always. The funny bit was neither of us could understand each other, but there was an ongoing exchange of broken Hindi and laughter. Two members of the extended family joined us, http://thesailingbee.com/mmtand so started the unceasing rounds of Apong. This time I didn’t mind it at all.